I thank you for the invitation to brief the General Assembly on the Report of the UN High-Level Panel of Eminent Persons on the Post-2015 Development Agenda. I would like to focus my briefing on the two aspects of the Report: its process of preparation and its substances. Let me begin with the preparation process of the Report. 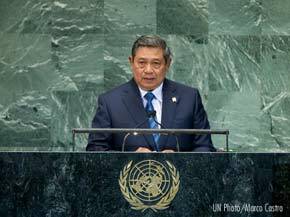 A year ago, Mr. Secretary-General established a High-Level Panel of Eminent Persons on the Post-2015 Development Agenda. He also appointed me, President Ellen Johnson Sirleaf of Liberia, and Prime Minister David Cameron of the United Kingdom as Co-Chairs of the Panel. The estblishment of the Panel is part of the Secretary-General’s post-2015 initiative mandated by the 2010 Millennium Development Goals Summit. And its objective is clear: to prepare a bold yet practical vision on a post-2015 development agenda. An agenda that places at its core shared responsibilities for all countries, and the fight against poverty and sustainable development. Today, on behalf of the Panel and the other two Co-Chairs, I am pleased to inform you that the Panel has successfully completed its mandate. And this morning I had submitted the Report to Mr. Secretary-General. Compared to other UN Secretary-General’s High-Level Panels, the working period of this Panel was relatively short. However, we managed to convene five consecutive meetings: in New York in September 2012; in London in November 2012; in Monrovia in February 2013; in Bali in March 2013; and lastly, in New York yesterday to formally adopt the report. Throughout these meetings, the Panel conducted rigorous and constructive discussions and consultations on the structure, narrative, and substances of the report. And through these meetings—in collaboration with the Panel’s Secretariat—we were able to sharpen the report from time to time. We have also carried out extensive open and inclusive consultations, involving not only the UN system but also extensive stakeholders. From civil society groups to parliamentarians, the private sector, academia, research institutions, women, and youths from all regions. The Panel has also listened carefully to views of farmers, workers of informal sector, migrants, people with disabilities, small business owners, women entrepreneurs, young people and children, and many more. I note that the Panel has had the privilege of interacting with more than 5000 organizations from more than 120 countries. The Panel also received and reviewed more than 850 written submissions of comments and inputs. These diverse perspectives have contributed to the immense depth and richness of the Report. These inputs are mostly about what we aspire in 2030 and how to get there. Through these extensive consultations and outreach, we believe that the Panel report is not merely a product of its 27 members. It is also a reflection of the interests of a wide range of stakeholders—who wish to unshackle the poor from the vicious circle of poverty. Now let me turn to the substantive aspect of the report. The Panel is convinced that our vision and responsibility is to end extreme poverty in all its forms. And this is in the context of sustainable development and sustainable growth with equity. The international community has done a lot in lifting many people out of poverty. Yet, one billion people still live on 1.25 dollars a day or less. Many people are also still lacking access to nutritious food, quality healthcare and education, as well as basic infrastructure such as fresh water and sanitation. This situation is even worse for women. In many countries, the situation has also been aggravated by violent conflicts, economic shocks and natural disasters. In the last decade, we have witnessed unprecedented natural disasters induced by climate change, which caused setbacks to the achievements of the MDGs. Therefore, if we are to cut the vicious circle of poverty, we need to address poverty in all of its manifestations. Also criticial to our efforts to alleviate poverty is a renewed global partnership. A genuine global partnership requires all stakeholders—be it government, private sector, civil society, scholar and international organizations—to have a sense of common purpose and to act in the common interest. We have taken these points into our conside-ration as we defined the Post-2015 Development Agenda, including its goals. Twelfth, creating a global enabling environ-ment and catalyzing long-term finance. I have to emphasize here that these illustrative goals are not meant to dictate what will be the definitive development goals. It is crystal clear that the definitive development goals are at the hand of Member States during the inter-governmental process. What appears in the annex is merely the Panel’s attempt to illustrate, based on extensive consultations and outreach, on what development issues need to be prioritized. Finally, on behalf of the Co-Chairs and members of the Panel, I would like to express our gratitude for the confidence Mr. Secretary-General has bestowed on us in advising him on the Post-2015 Development Agenda. This report might not be perfect nor satisfactory to all of us. However, we humbly hope that the report could provide fresh ideas and inputs to Mr. Secretary-General and all distinguished Member States about the shape and vision of our development agenda beyond 2015.